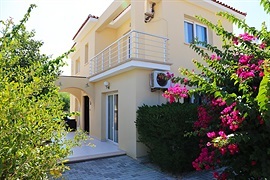 Holiday villas to rent in Lapta Village, with natural springs and sandy beaches. My Favourites You have no favourite villa. All around the town of Lapta, mountain springs erupt from the mountainside, giving any holiday villa in the hillside village a feeling of green lushness when all around is parched and dry. As you drive up the winding road to your villa for rent in Lapta, you'll past through fragrant orange, lemon and olive groves, fed by the ever-flowing mountain waters. At each twist and turn, you'll see a different view of this intriguing town, built on natural terraces in the mountainside. 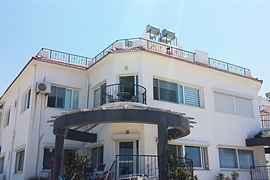 Villas for rent in Lapta or Lambousa, now there's a question! 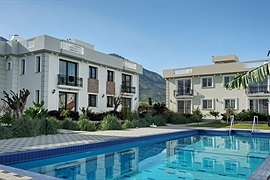 Holiday villas in Lapta are not always in or near the town centre, as Lapta is unofficially 'divided' into the mountain town itself, and the coastal Lapta 'strip' in the area around ancient Lambousa. Lapta is a lovely town to simply wander around from your holiday villa, and it's well worth a gentle stroll into town to see the fine Ottoman stone mosque and picturesque, if somewhat decaying, old churches. 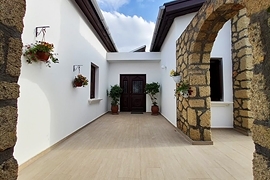 On your villa holiday in North Cyprus, you'll always find Lapta restaurants to suit your tastes, or a bar to serve you a cool drink on warm evenings. Villa owners in Lapta always recommend the Aphrodite fish restaurant, for their fresh fish and stifado, a rich game stew with onions, red wine and cinnamon, served with chips. The owner Cemal also makes his own wines, well worth a glass or six! The Veni Vici Italian restaurant serves excellent traditional pasta dishes, for a taste of the other side of the Mediterranean while in North Cyprus. Popular bars on the coast include JK's, and the ex-pat's favourite, the Stumble Inn. The sun on your face, a cooling, breeze, the scent of lemon groves... Ah, it must be a perfect villa in Lapta from Amy Villas! This page is prepared in 107 ms.